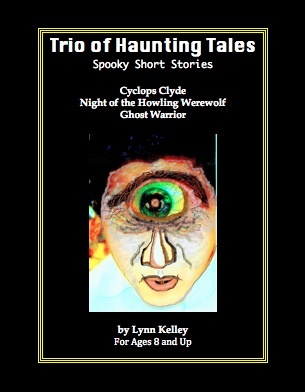 Trio of Haunting Tales offers three short stories for kids age 8 and up who love spine-tingling fiction. Great for reading aloud at ghost-story gatherings, such as sleepovers, around a campfire, in the classroom, or at home for a night of spooky, family fun. Cyclops Clyde, a freaky computer monster, wreaks havoc both on and off-screen, taunting and paralyzing his victim. In Night of the Howling Werewolf, Eric Lung searches out the bullies who jumped his best friend, Ben, and stole his bike. Things get weird on Slaughter Hill, the bullies’ favorite hangout. Ghost Warrior kicks the fright factor up and will creep out even the bravest of souls. Connie worked overtime and now worries that she’ll be punished with extra push ups for being late to karate class, but push ups become the least of her problems when rival ghost gangs that haunt the parking structure claim first dibs on this mortal prey. Lynn Kelley’s well-written tales mix horror with bits of humor.